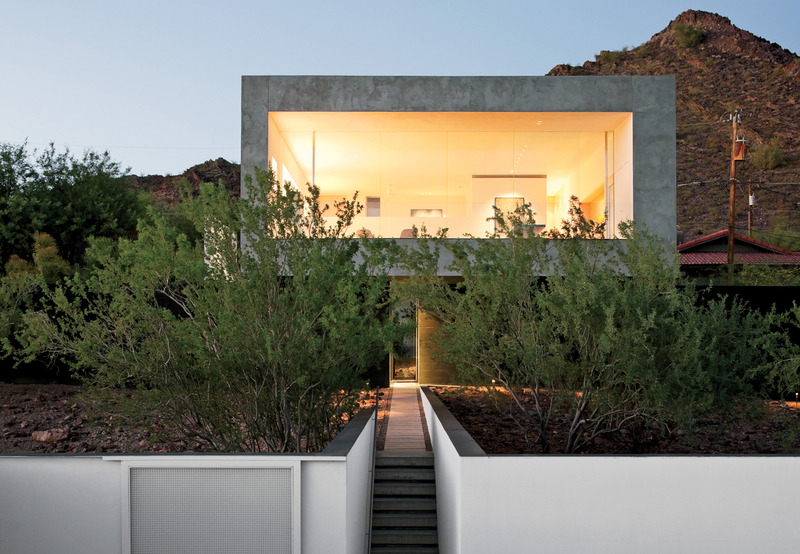 At the base of Echo Mountain in Phoenix, a geometric home by Wendell Burnette opens up to the surrounding desert landscape. Architect Christoph Kaiser turned a dismantled grain silo, purchased online from a Kansas farmer, into a cozy studio in Phoenix, Arizona. The 190-square-foot space is outfitted with a highly customized interior—only the Eames dining chairs were not made by Kaiser—that serves as a comfortable home for him and his wife. Our first-ever cover star, the House of Earth + Light, has evolved in the years since its Dwell debut. Subsequent homeowners made the house more effecient, as detailed in our 2009 follow-up piece. The Containers on Grand apartments put Phoenix in the vanguard of shipping container rental housing. The eight container apartments, huddled together in a wise use of the space, are situated on an old used car lot in downtown Phoenix. Not quite a ressidence, but certainly stunning, Scottsdale's Saguaro hotel by Peter Stamberg and Paul Aferiat of Stamberg Aferiat Architecture pays homage to its setting with vivid colors inspired by native desert plants.